Henrik Ibsen (1828-1906) wrote several plays and is celebrated as the father of realist drama but moved into more symbolic drama that would characterize his last three plays. The Lady from the Sea (1888) is one of Ibsen’s rarer works and proves to be unusual and exciting. Ibsen chose the name Rosmer as a reminder of a Norwegian legend of a merman who lures women to their death in the sea. The Lady from the Sea, Ibsen’s next play after Rosmersholm, is also inspired by Norwegian folklore, in this case the ballad “Agnete og Havmanden” about a merman who lures a married land woman to live with him in the sea. For Lady, Ibsen takes elements of the earlier play’s structure and imagery and develops them in an entirely new way. Ibsen’s pioneering, modernist plays of the late 19th century are set in northern Norway, insular small town communities where women felt inhibited by the confines of marriage. Creating strong, emancipated heroines, he wanted to express his view that “women cannot be free in contemporary society, it is an exclusively male society”. The setting and the cast are well suited to the change and works well for a modern audience. The Lady from the Sea is more symbolic, inspired by Nordic folklore and mermaid legend rather than social realism with a romantic scenario ideal to adapt into an opera. The original five act play has been edited down to focus on the central theme, the emotional state of mind of a young woman, Ellida, haunted by romantic memories and her love of the sea. 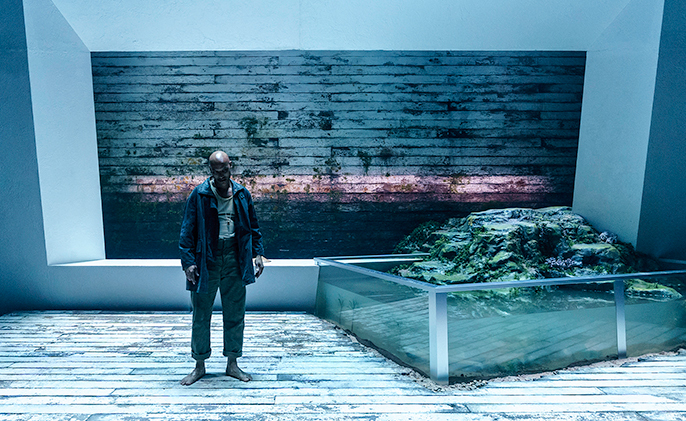 The production of The Lady from the Sea is true to Henrik Ibsen but not exactly radical. We have eternally been drawn to the sea, as society has long been drawn towards the conformity of marriage. 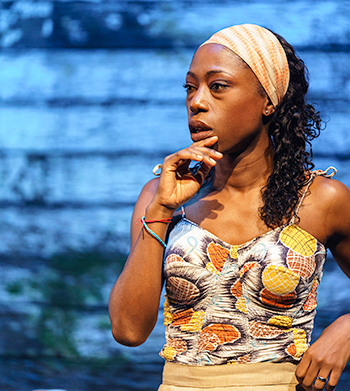 Directed with his normal professionalism by Kwame Kwei-Armah and designed by Tom Scutt; this new version by Elinor Cook, is set on a Caribbean island in the 1950s and not the Norwegian Fjords in the 1880s. The setting and the cast are well suited to the change and works well for a modern audience. The set, the performances, alongside the writing deliver an entertaining piece of theatre. Elinor Cook’s new version clarifies a familiar text. The play covered family topics of marriage, love and the role of women. This play was thoughtful and meaningful. It was a decent version of Ibsen’s play with a very modern contemporary feel. The cast includes Nikki Amuka-Bird, Jonny Holden, Finbar Lynch, and Tom McKay. Helena Wilson and Ellie Bamber are convincing in the roles of Bolette and Hilde, and this production highlights the desire for escape and their wish to be observed. Jim Findley (Ballestred) and Jake Fairbrother (The Stranger) added well to the cast. The Lady from the Sea is recommend to all fellow theatre lovers. The play runs for 100 minutes with no interval but the audience is kept engaged throughout.